Year after year, testimonies abound that your investment is impacting the Kingdom of God…by commitments that are made, ministries that are started, churches that are planted among the unreached. And lives that are changed, and souls that are saved at the MTM leadership conferences, Bible Schools, youth meetings, and night revivals! 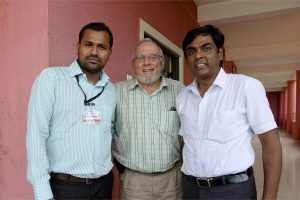 L-R: Pastor Santosh, Raymond Burkholder, Pastor Benjamin. Since attending an MTM conference in June 2017, Pastor Santosh has quit his government job to evangelize unreached villages. He has plant 2 new churches with a total of 41 new believers in Christ. Pastor Benjamin has planted more than 80 churches in one of the worlds largest slums, located in Mumbai India. He is begging MTM to build a Bible Institute facility in India and conduct two pastoral leadership trainings yearly. Again, a very special thank you, to you as individuals, families, churches, and guest teachers who support this ministry.